The Bhagavad Gita is very well known scripture and has attained a sublime position in the long list Indian scriptures. The Gita is honoured and respected not only in India but also in various countries because of the transcendental knowledge that it possess. The Bhagavad Gita is very well known scripture and has attained a sublime position in the long list Indian scriptures. The Gita is honoured and respected not only in India but also in various countries because of the transcendental knowledge that it possess. It is that divine knowledge, which appeared from the divine voice of Lord Krishna and his devotee Arjun received that knowledge. It is at the end Arjun admits that it is because of the grace of Lord Krishna, he gets liberated from miseries, tribulation and dilemma. Bhagavad Gita Chapter 2 is also known as Sankhya Yoga. 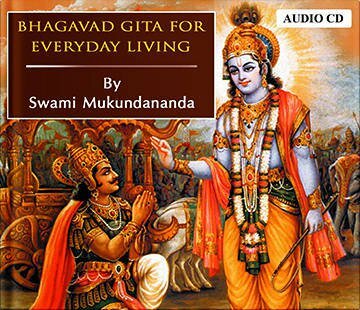 Swami Mukundananda in his simple and unique language explains the trade-off position of Arjun and how Shree Krishna guided him. The soul, the body, the nature of the world, Karm yog and the ultimate goal are all explained beautifully in this lecture.